Good evening Gentlemen, I need your help to identify this decoration which I believe to be British, but so far I have only seen "For Life Saving" or "For Gallantry" Crosses but no "For Merit" Cross. Cheers Bill Reverse of the medal is completely blank and there is absolutely no maker's mark. Good evening, I need your help to identify this medal which I believe to be Japanese. I have found nothing similar so far. The crown puzzles me. Cheers. Bill Reverse of the medal is completely blank and there is absolutely no maker's mark. unknown badge with fasces and axe. UK? Belgium? Dutch? Luxemburg? Unknown CCM Badge Pilot Wings ? Hello, I've seen some of your rexist badges. Would you have something for sale or trade? 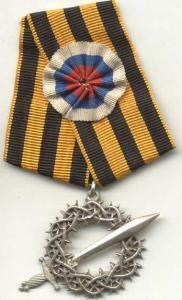 Unidentified Russian emigration badge OÎ Ð’Ð‘Ð� or OÎ Ð’Ð‘Ð” ?